Based on the geographical distribution of plants, Estonia mainly belongs to the northern area of the nemoral-coniferous or mixed forests of the temperate zone. The proportion of dominant decidious and coniferous forests is more or less equal, covering 51% and 49% of the total forest area respectively. 81% of forest land consists of 3 main species – Scots Pine (Pinus sylvestris, 29 %), Norway Spruce (Picea Abies, 23 %) and Silver and Downy Birch (Betula pendula and Betula pubescens, 22 %). 99,8% of the forests consist of native tree species. There are 36 protected orchid species. 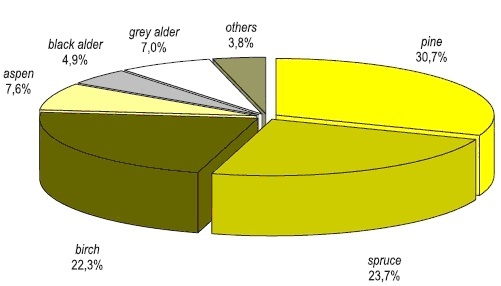 Distribution of growing stock by tree species. Estonia is rich in fauna. This is due to the location – on the northern border of temperate zone, close to the sea and to the vast forests of Russia. An important part of forestry is game management – in order to preserve wild game resources. A total of 55 species are listed as game species: 18 mammal species and 37 bird species. Moose, wild boar and roe deer are the most important game species. Furthermore, the population of big game species is large enough for hunting. 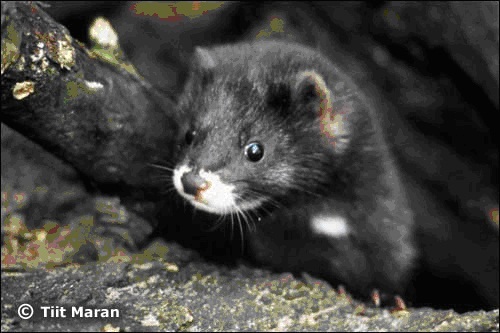 European mink (Mustela lutreola) is listed by the IUCN as Critically Endangered due to ongoing reduction. Its decline has been calcuated to more than 50% over the past three generations and it is expected to decline at a rate exceeding 80% over the next three generations. In Estonia its reduction seems to coincide with the spread of the American mink. European mink now exists only on the isolated island of Hiiumaa where it has been reintroduced since 2000 and from where the american mink was removed). European mink (Mustela lutreola) – endangered species in Estonia.